Spray outlets: These consist of a showerhead, a hand-held shower, and body sprays--valves that simultaneously spray water towards your body. Mixing valves: These mix the hot and cold water from the pipes, sending the water to the outlets. There will also be controls for water temperature and the intensity of the water flow. Control valves: These direct the water to the different spray outlets. 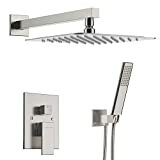 You’ll also notice that they come in nickel or chrome finishes, which are quite aesthetic as well as being functional. Normal mixer showers: These are low-tech versions, using the standard method of mixing the hot and cold water to your liking. This has the drawback that you can lose cold water when someone flushes a toilet, washes dishes, or operates a washing machine. Electric showers: These take in only the cold water, and raise it to the desired temperature by passing the water over a heating element. It’s different from a boiler, which stores hot water in a reservoir. Digital showers: These allow you to program the exact temperature of your shower--in some models, it is even possible to program them with a remote control or WiFi! Airdrop showers: These inject jets of air into the water to increase the water pressure, while actually saving water! Different types of water jets: You’ll notice that there are showers that offer a variety of water jets. Some common ones are rainfall setting, jet pulse, and waterfall setting. Glass-shower screen preferred to shower curtain: A shower curtain tends to accumulate mold and mildew over time, and is difficult to clean properly. A glass enclosure for your shower is preferable since it is easier to clean and will eliminate mold build-up. 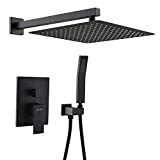 Aesthetics: You can find a number of shower systems that employ some neat effects for added aesthetics, which set the mood when taking a shower. Sumerain offers a number of LED shower heads that illuminate the water coming out of the shower in either green, blue, purple, or pink light! Avoid problems with hard water: If you live in an area with hard water, you might encounter problems due to lime deposits over time. The Sumerain Shower System (Model S3218NI) has rubber nibbins (small spray holes) which prevent the buildup of lime deposits--they can be easily wiped clean so that the lime doesn’t accumulate. 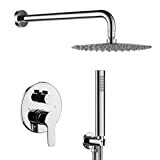 Maintaining pressure: A simple shower has only one shower head. 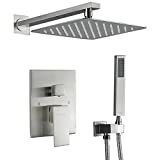 When you convert that into a shower system, the water is distributed into many spray outlets. The water pressure should be maintained so that none of the outlets drops beneath the minimum flow rate. The pressure should be at least 50 pounds per square inch. If you can’t achieve this pressure, there are shower pumps that can be installed, to boost the pressure. Maintaining water volume: As we mentioned, there is the airdrop shower system, which employs a jet of air to maintain the water pressure. It gives you a massaging, invigorating shower while conserving the amount of water used! It uses 6 liters per minute, as opposed to other showers that use 8.3 liters per minute. Maintaining water temperature: You also want to make sure that you’ll get adequate amounts of hot water to all the spray outlets. It is estimated that a 50-gallon hot water heater will suffice for an 8-minute shower. Also, It is recommended that a shower have a built-in thermostat to compensate for any sudden changes in the flow of hot or cold water. 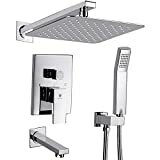 Numerous shower systems are equipped with such thermostats, that have digital controls to manage the temperature precisely. 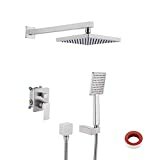 The Kes SUS 304 Stainless Steel Thermostatic Shower Panel has a thermostatic control as well as an anti-scald safety stop to prevent you from getting hurt if someone uses a large amount of cold water suddenly, as when flushing a toilet. Adequate size drain: The drain should be large enough to adequately dispose of the wastewater. A drain that is 3” wide in diameter should suffice. 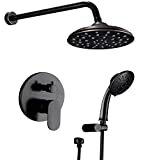 Kojox is a maker of shower systems with a high-pressure rainfall showerhead, as well as a handheld showerhead and faucet valve. They also make other accessories for the bath and shower. KES is based in Heshan City, China. They make bathroom faucets, sinks, showers, and numerous accessories, such as towel racks, shower baskets, soap dispensers, and more. They also make products for the kitchen and toilet. 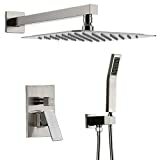 Ello & Allo are manufacturers of rainfall showerhead systems, as well as luxurious accessories for the shower and bath. They make bronze towel bars, toilet paper holders, faucets, mop & broom holders, and more. 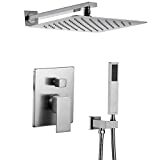 Embather is a manufacturer of shower systems, showerheads, bathroom accessories such as towel racks, kitchen sink faucets, and more. Esnbia makes shower systems with a brushed nickel faucet. Their shower is wall-mounted but also has a hand-held option as well. Sumerain, based in Shuikou, China, is a maker of a wide range of faucets for the bath and shower. 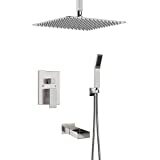 Their products include waterfall faucets, shower faucets, antique faucets, stunning LED faucets, and more. They have branches in Hong Kong and the U.S.A. as well.